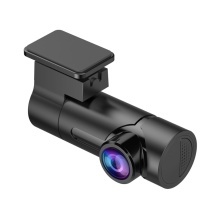 Mini dash cam, conveniently fits behind your rearview mirror to capture the road ahead. 1080P HD camera, record every important moment of your driving clearly. Starlight night vision, you can use even in the dark, won&apos;t miss anything. 140° wide angle and 270° rotatable camera offer a broader view which enables you to monitor the whole road while driving. Gravity sensing function, automatically lock the current video when vibration occurs during the recording, record the primary accident scene. Loop Recording allows continuous use by writing over old, unneeded footage for efficient storage management.